The Belgians came, they saw, and, oh man, have they conquered. Well, an American did grab one win and that was a UCI race, so I guess it counts for something. The first week of the international season is under way and is there ever a bunch to talk about! First is CrossVegas, so much going on there. We can’t not talk about this weekends upcoming races in Seattle, Vermont and Maryland. 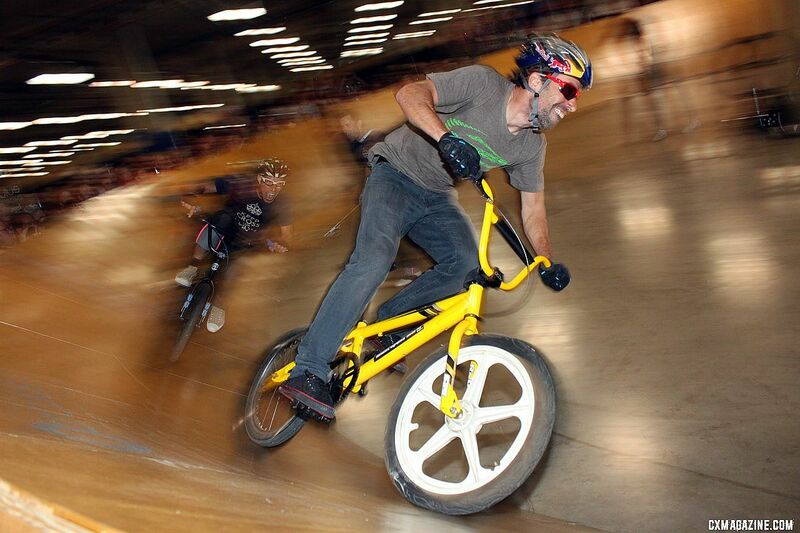 Did you catch the velo bowl? Jurgen Mettepenningen is confident in Pauwels, Aernouts and Vantornout. 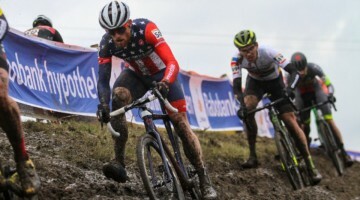 National Champ Todd Wells will not defend his stars and stripes this January; London Olympics and Louisville 2013 are the goals. Finally, in this week’s Working Man’s Edition there were just too many of you, so instead, there’s a list of all the riders that deserve some respect! Cross Vegas, How Can We Not Mention It!!! Wow, Cross Vegas, so exciting! For the first time in the history of the weeknight event, we saw some “true” ’cross conditions (whatever those may be.) No half lap pits were necessary, but the bikes were not looking all too clean either. I guess the weather gods wanted to show the Belgians a little love. They didn’t need to though. There have always been a few of the Euros over in the early part of the year and they are always up there in the mix, but this week we saw a show of force on their part. The Euros took the top three spots regardless of the good efforts given by Driscoll and Trebon to really make things happen. But importantly we have to talk about the bunny-hopping issue. When the UCI changed the barrier height rules, it was pretty apparent that bunny hopping was going to be necessary. Remember way back when Sven Nys changed the game and started hopping the barriers to get a big gap in races? Well, that was exactly how things went at CrossVegas. Even though Driscoll had made a good run at getting away, his running the short stairs cost him valuable time to stay with Wellens and possibly put either Wellens or Driscoll on the top step away from a bunch sprint. So … pro ’cross is now about barrier-hopping in addition to all the the other little pieces of the puzzle (sprinting, technical skills, threshold power, etc.). So much to talk about with CrossVegas, so little time. One big bummer, though understandable, was that we did not see Katie Compton line up at the unofficial season opener. Why did we miss out on seeing the record-holding US National Champion? 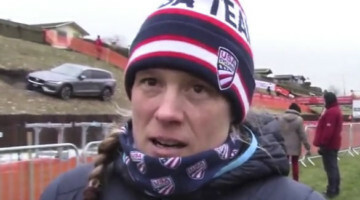 Because Katie wants to win the World Championships and being fast in September is not important relative to being fast at the end of January. Good luck, Katie, can’t wait to see you winning races again soon. 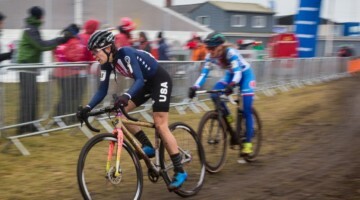 To stick with the women’s race, are we welcoming in the era of Katerina Nash here in the US? Katerina has taken a reduced mountain bike racing schedule recently to focus on ’cross and it is clearly working. But Katerina has some big goals in mind, like taking on Katie Compton, World Cups and World Championships. So, another woman coming after Compton. Things are going to be exciting this fall and winter, especially with Georgia Gould, Nicole Duke, Kaitlin Antonneau, Amy Dombroski and many others. A Big Weekend of Racing on the US National Scene! Did you Catch the Velo Bowl Johnson vs. Powers? Oh, if you missed it, it was awesome to watch former teammates go after it at the Circulus. The two of them were really gunning for it at Interbike before CrossVegas! So, who won? 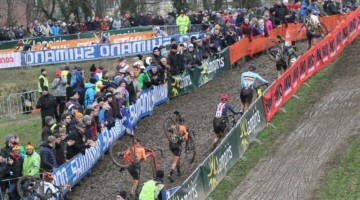 Well, go check out our report, photos and videos of the fight at the Circulus, hosted by Rapha! Moving onto the Euro field, reports are slowly coming together from across the field as people are making big news statements about how the season is going to go. Jurgen Mettepenningen is confident in Pauwels, Jim Aernouts and Vantornout. So, is correctly confident in their abilities? Well, in Pauwels for sure, but is Vantornout really going to come around? He’s had a rough few seasons, though he was able to ride at the front a bit last year, but he really couldn’t put together the same level that Mettepenningen has asked for (don’t forget he likes to fire riders for non-performance). Well, only a few weeks until the Belgian season starts and we can find out what happens. In some rather disappointing news, National Champion extraordinaire, Todd Wells, will not be defending his stars and stripes this January in order to focus properly on the 2012 London Olympics. 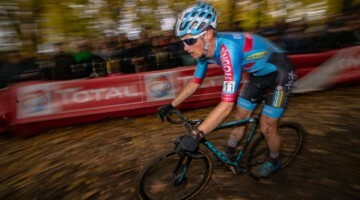 Not only will Todd be skipping this years Nationals, but he will be doing an even further reduced schedule than we are used to seeing from him as he has added La Ruta de los Conquistadores to his fall schedule in order to prep for the 2012 Cape Epic with World Cross Country Champion Jaroslav Kulhavy. (Those Czech’s seem to be mopping up rainbow stripe jersey’s of late, wonder if Katerina can do it this January?) Well, good luck, Todd, and we look forward to seeing what you can do on the ’cross circuit this year, following your third run at the Olympics and going after the Louisville World Champs … sounds like 2012 is going to be a big one. In this week’s working man’s edition I think we just need to throw out some names because there were way too many of them. So here is the list of working men destroying it over the past week: Spencer Powlison, Allen Krughoff, Justin Lindine, Sean Babcock, Bryan Fawley, Jake Wells, Tim Allen, Brandon Dwight, Brady Kappius, Molly Cameron, Alison Mann, Lisa Hudson and Kate Scheider. I’m sorry for whoever I’ve missed, but you all deserve mad respect! If there’s anyone I missed, please put their name in the comments section! But I was in the group with Dwight, Allen, Myerson, and Wells until two laps to go in Vegas, and back at work by 3pm the next day. See everyone at the Ft Collins USGP!